Working in 3D, visual input is more a process of winnowing than lack of stimulus. We live in cultures saturated in the visual; static or otherwise. Built environments from the remarkable ugliness of Parramatta Road to the bucolic beauty of Central Tilba. Architecture imposes its influence both in the solidity of its external form, but also within the internal spaces it defines. Coming across an image of Elizabeth Bay House, I wondered about the subtle influence that such places impose upon one's aesthetic. 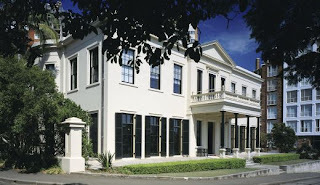 Now surrounded by a high density urban enclave, Elizabeth Bay House was built for the Scottish administrator Alexander Macleay, Colonial Secretary of the colony of New South Wales. 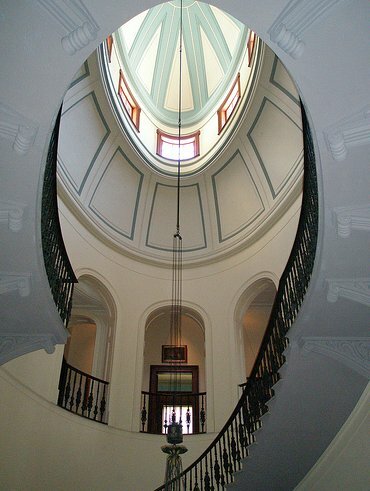 Something of a folly to high Victorian obsessions of caste, learning and compulsive collecting, its history includes neglect and decline, the loss of its original 28 hectare curtilage, and division into sixteen flats during World War II. As a young child, I visited the house as an old friend of my mother's had the upstairs Eastern flat. Aunt Mickey would position an overstuffed chair at one of the windows, and I would spend hours happily watching the buzz and hurry of a working port from the heads back up the harbour. I also remember the joinery - vast cedar skirting boards and door architraves laughingly enormous in comparison to the mean painted 1960s joinery of home. But what I remember with all of a child's awe is the staircase. Flats had been created by erecting fibro walls, like so many film sets, but the sheer scale and form of the stairwell could not be subsumed. It creaked, it was somewhat worse for wear but it was an extraordinary march up and up and up to Aunt Mickey's flat for a small child sliding her hand on the handrail, grasping her mother's hand in the other.